MOVING TO EAST POINT OR OPENING A BUSINESS? Visit EastPointCity.org for more information about the City of East Point. 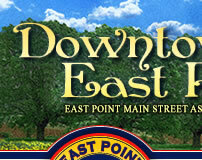 Welcome to Downtown East Point! Downtown East Point is a wonderfully diverse and unique community only 10 minutes from Downtown Atlanta.There is something for everyone in Downtown East Point, from the beautifully restored lofts to the local pizza "hang out" to the neighborhood tavern located next to the trendy clothing store. Come explore Downtown East Point. We are a short drive from I-75, I-85 & I-285 or you can simply hop off the Marta Train and instantly be in the heart of it all. We hope to see you soon! Get directions and parking information and visit East Point.